This Chandra image shows multimillion degree gas in two galaxies in the Virgo galaxy cluster that are now more than 100,000 light years apart. In NGC 4438, the larger galaxy in the lower part of the image, filaments of hot gas have been pulled to the right of the galaxy. The hot gas in the smaller galaxy, NGC 4435 (upper right), is concentrated around its central region. Combined X-ray, optical, and radio observations indicate that the two galaxies bumped into each other in the relatively recent past, about 100 million years ago. 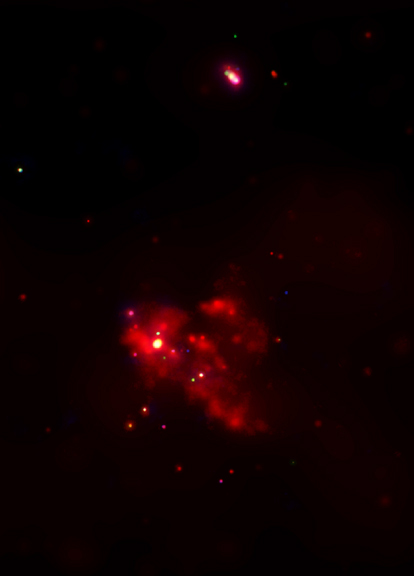 The collision was apparently a glancing one, in which the galaxies came within about 16,000 light years of each other. Such collisions are relatively common in the crowded confines of the Virgo galaxy cluster. The center of the cluster contains hundreds of galaxies whizzing around at speeds of millions of miles per hour. 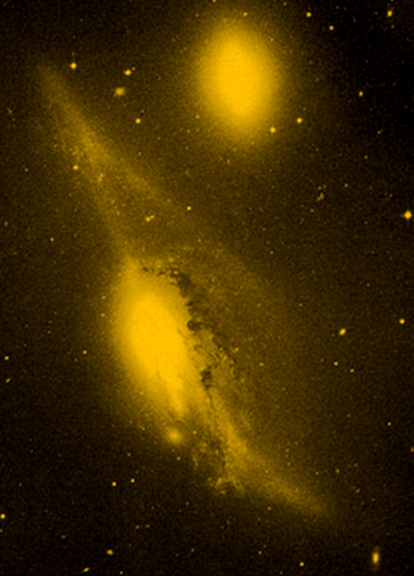 During the encounter between NGC4438 and NGC 4435, gravitational tidal forces tugged at the gas and stars on the outer parts of the galaxies. NGC 4438 was damaged in the collision, but the hot gas will probably fall back into the disk of the galaxy in a few hundred million years. NGC 4435, being less massive than NGC 4438, proved to be less crash worthy and appears to have lost most of its hot gas to intergalactic space. Coordinates (J2000) RA 12h 27m 45.60s | Dec +13° 00´ 32.00"
References M. Machacek et al. 2003 submitted to the Astrophys. J.